Sick of high energy costs or looking for ways to reduce your carbon footprint? There are some simple things you can do to improve the efficiency of your household’s energy usage. Which of these tips will you apply to your home this year? Once a year, it’s a good idea to have a certified HVAC technician inspect your equipment to check for component failure, refrigerant leaks, and assess ductwork. Changing your air filter once a month and clearing grass and leaves from outdoor units also helps keep your equipment functioning at full capacity. 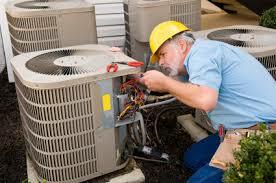 Clean systems are more efficient and a proper routine maintenance helps your system last longer. If your system is still under warranty, most manufacturers require annual maintenance to maintain your warranty. Weather-stripping is the material around doors and windows that seals your house from the elements. It naturally breaks down, tears and peels up with age and use. If you see damage to your stripping or feel a draft when you hold your hand near a crack, that’s a sign that it’s time to replace your stripping. This Old House estimates you could save 10 to 15 percent on your utility bill simply by improving the insulation around your windows and doors. Stripping is easy to install and usually only requires you to measure, cut and nail it to fix it in place. According to Spark Energy, the average home loses 25 percent of its heated or cooled air through windows. Older windows allow the most extreme losses, but even newer double-paned, properly installed windows let some heat and cold seep through. Installing new windows is a good option when you have the budget and your windows need updating, but if you cannot afford the investment, insulating drapes or blinds could do the trick. There are a variety of options on the market with styles and colors to match any home decor. Plus, most homeowners can install drapes or blinds themselves. Rather than manually raising and lowering the temperature on your thermostat, consider buying a programmable thermostat that will handle the adjustments even when you forget. Programmable thermostats can save money by automatically adjusting the temperature at night time or when away. Experts at Addcox say dropping the temperature between 2 and 3 degrees can save an estimated 10% on your utility bills. Dropping the temperature in your house more than 4 degrees can cost you higher utility bills and make your equipment work harder and longer. All electric systems may greatly benefit by adding an outdoor temperature sensor in addition to your programmable thermostat. This will give the system the ability to manage when and how the emergency heat is being used. Most utility companies will offer a cash incentive to have a heating contractor install a programmable thermostat and outdoor sensor. If your air-conditioning unit is 10 years or older or your furnace is 15 or older, it could be time to replace them with upgraded units. Energy Star says you could save 20 percent on your utilities with a high-efficiency air conditioner and 15 percent with a new furnace. Upgrading your system not only saves you money on your utility bill, but high-efficiency systems come with rebates and tax credits from your utility company and the state. According to Energy Star, 2017 will be the last year to get Tax Credit rebates on new heating equipment.